This summer we did more traveling than we usually do. In July, Matthew and I took a much needed parents-only vacation to London to stalk Kate Middleton to visit my cousin and adopted the hashtag #RoyalRichmonds as we Instagrammed our adventures at all the royal sights. 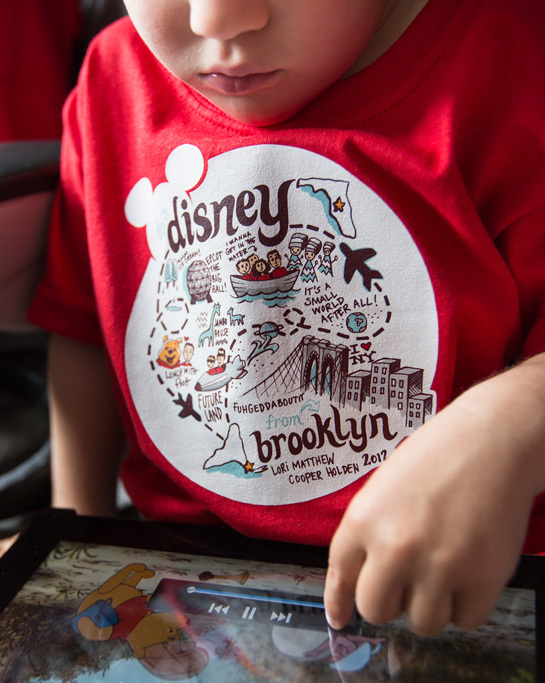 In August, we packed up the kiddies and made our third trip to Disney World in our matching custom shirts, of course. 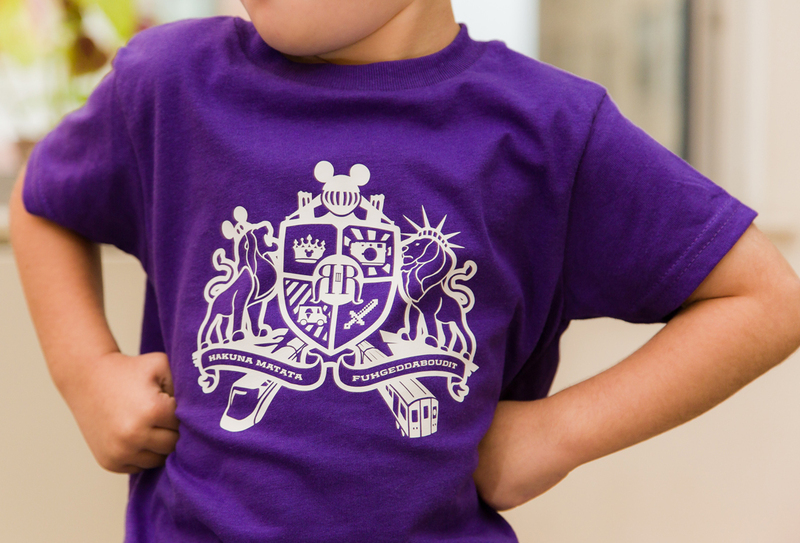 For this year’s design, we took a little inspiration from London and created a coat of arms with a Disney twist! Rather than use typical Avery iron-on sheets to transfer the art to the shirts, we took things up a notch and finally got the Silhouette Cameo cutter we’ve been coveting for a while. This thing can get craaazy detailed! After importing the art from Illustrator into the Studio software, the Cameo die cut it on the sticky transfer paper and then Matthew painstakingly removed all the negative areas with a little pick that looks like a dental tool. We then spent about 2.5 hours total actually ironing the art onto the shirts. This was definitely much longer than the instructions let on, but the end result came out way better than we could have done without the Cameo! THANK YOU to PRINT Magazine who awarded our shirts in the “PRINT Celebrates Design” competition! I will jump at any opportunity to have us wear matching shirts (have you seen our baseball party?). I know there is a only finite amount of time I can continue to do this before I am met with eye rolls, refusals and sighs of, “mom, you are so weird and lame.” And so, a new tradition was born. 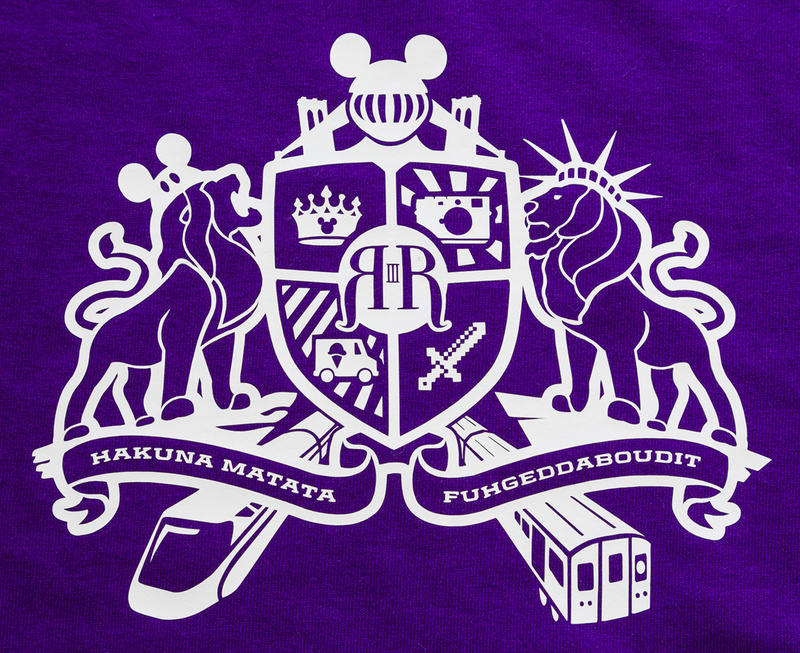 While the kiddos still think it is the most fun thing ever, on the day of departure of our annual family vacation we’ll all don custom t-shirts designed by us! Our trip this year was to the happiest place on earth, Disney World. 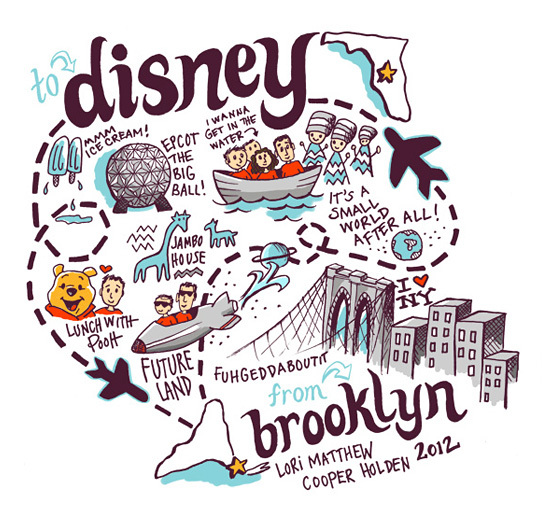 The inspiration for the illustration came from some hand-drawn infographics we’d seen recently, as well as private jokes and fun moments from our first trip to Disney last year. The kids got to participate in creating the shirt by choosing which rides and stories to highlight (lunch with Pooh and It’s a Small World were must-haves) and helping art direct me as I drew. Check out some photos of our trip (and shirts) on Flickr.